The battered 22nd Battalion left the Somme back area by train on 5th September 1916 for their first visit to Belgium and to begin a period of recuperation and regrouping, first in the rear area and then what was at that stage, the quiet sector outside of Ypres in the vicinity of Hooge. Here they stayed until mid-October rotating with their sister battalion of the 6th Brigade, the 23rd, in week long stints at the front in the area of Sanctuary Wood, and to the rear in support. During this time the strength of the Battalion increased receiving both the reinforcements that had arrived from Australia together with some of the returning wounded, via the 2nd Australian Division Base Depot at Etaples. The Battalion was billeted in the ruined city of Ypres while in support and were lightly but constantly shelled, during which time the Battalion suffered a few casualties. Back on the Somme General Haig, Commanding Officer of the BEF, had been persevering with his strategy of keeping the Germans under pressure and from time-to-time striking heavily to try and force the breakthrough. 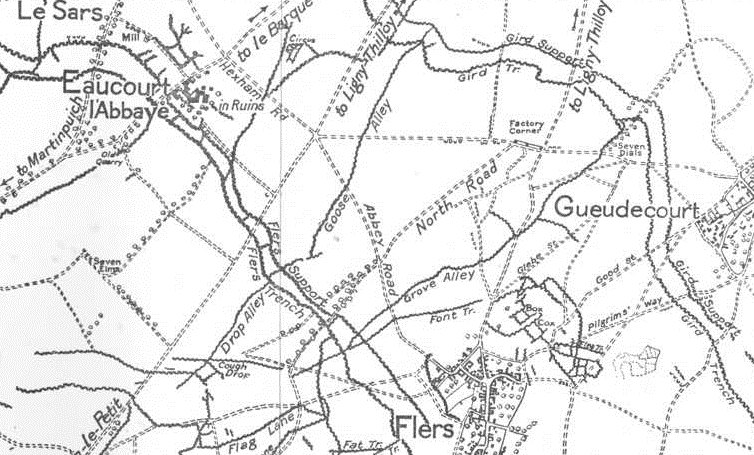 Further large scale attacks would also take place around the Ancre, but it was to the Le Transloy area and around Flers that the AIF would be re-introduced to continue these small scale probing attacks. I Anzac Corps would thus be heading south, this time joined by the Fromelles blooded AIF 5th Division that would precede the Corps. The 22nd Battalion was relieved by the 11th Northumberland Fusiliers on the 18th October to begin their journey south and to Buire just to the south-west of Albert where they would be billeted for six days practicing and training. However the Somme to which they had just returned had taken on a new character since the dry days of summer when they were last there. The tour of line work at Flers commenced for the 22nd Battalion on the 4th November 1916, where as described by Capt. Gorman in his history of the Battalion ‘for the Battalion no other mud attained such a notoriety as that at Flers, with a consistency, depth and stickiness unequalled by anything afterwards encountered in Flanders. ‘As bad as Flers’ was adopted as a standard description of filth and wretchedness’. The 6th Brigade took over the Flers sector from the 8th Brigade (5th Division), with the 7th on the left flank and the 1st Brigade (1st Division) on the right. At this time the Battalion was tasked with performing Brigade and Engineer fatigue duties. The weather was bitterly cold and the trenches extremely muddy and boggy, and as a result there were great difficulties bringing up supplies owing to the conditions of roads and the weather. The communication trenches were pretty much useless with all but in the most forward area movements being made in the open. On the 7th November A & D Companies of the 22nd Battalion moved to Wattle Trench to replace the 23rd Battalion where work at improving the trenches continued. Through this time enemy shelling was very heavy at times resulting in casualties and it was at Factory Corner where the Battalion had its HQ (photograph right) that Lieut. McCormick was killed. On the 11th November the 22nd Battalion relieved the 23rd Battalion in the front line, but progress was slow along the poor duck board track to the front. Upon arrival at the font-line the trenches were in bad condition, were shallow and afforded little protection from shell fire. Digging therefore commenced at once and before dawn of the night of their arrival a sufficient depth had been obtained to avoid undue losses. Work on improving the trenches continued for the next few days, including the construction of Yarra Bank sap where a post was subsequently placed. 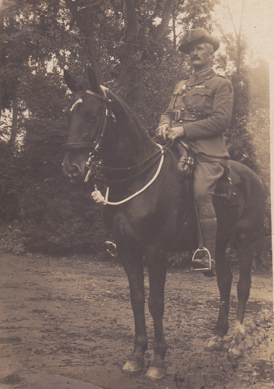 During their time at Flers all ranks suffered great hardships from the cold and mud. Trench foot became prevalent and the use of whale oil and frequent rubbing minimised evacuations from the cause but the absence of any facilities for dry standing made the carrying out of these preventative measures extremely difficult. In a week that the 2nd Division manned the front-line 205 cases of trench foot were reported. During the course of the war ten men from the 5th/22nd would be treated in hospital for trench foot, the majority occurring during these winter months of 1916-1917 on the Somme. The work of stretcher-bearers, never easy, became intolerable. The carriage of the wounded was performed by teams of six or eight men per stretcher and working in four or five relays back to the dressing station. These stretcher-bearers were quickly worn out, and for the wounded that they were carrying a journey in pain of up to six to seven hours over the short distance between front-line and the forward aid-posts had to be endured. On morning of the 14th November the 5th Brigade mounted an attack with assistance from the 7th Brigade which drew a response by the German artillery along the whole line. During the afternoon 18 enemy aircraft flew over the 22nd Battalion line reconnoitring the position, dropping light signals as markers. At this time ‘C’ Company was manning the front trench, and under the direction of the enemy aircraft was being heavily shelled. With great danger to his men unfolding Captain JS Dooley (photograph right, courtesy of LWH collection) coolly led his men forward some 120 yards and occupied shell craters until dusk, also making sure that they did not advance too far to come within range of their own artillery. Whilst the trenches held by the 22nd Battalion were practically destroyed, the company suffered only three casualties, and for this action Capt. Dooley was awarded the Military Cross. 548 Pte Adams who acted as a runner through the heavy artillery barrage back to Battalion HQ was also awarded the Military Medal. The following day and while the 5th Brigade attack was still taking place, 505 Pte Kenyon volunteered to look for wounded Sgt Lusby and successfully led him back through the enemy barrage, and was awarded the Military Medal. Later that evening the 22nd Battalion was relieved by the 21st Battalion and returned to Flers Trench, where they continued to perform fatigue work and carrying duties for front line units, plus construction of deep dugouts. On the 19th November 1916, on what would be the day after the end of the four & half month Battle of the Somme, the 22nd Battalion was relieved by British 2nd Infantry Brigade. Once again it proved to be a great ordeal moving over many kilometres devoid of any duckboards, and as Capt. Gorman recalled ‘with the vision of the YMCA soup kitchen driving the men on.’ Four nights were then spent in huts near Fricourt, and the following days were given to the removal of mud from the adjacent roads and carry out Corps Engineering work including road construction. As the war correspondent Charles Bean wrote in his Official History, the period that the AIF spent on the Somme in the Flers sector formed the most trying period ever experienced by the AIF on any front. The two attacks made by the AIF Brigades failed to make any significant gain and with the conditions worsening across the whole front General Haig ordered the halt to the great Somme Offensive on the 18th November 1916. For the 22nd Battalion its time in the Flers sector was as much a fight of survival against the elements as it was the enemy. From the CWGC records nineteen men from the Battalion were killed over the period that they were at Flers, including 19 year-old 2356 L-Cpl Quinn of the 5th/22nd who died from his wounds after being hit by a shell on the 15th November, but this death toll could have been greater if it were not for the clear thinking of men such as Capt. Dooley as described earlier. For the 22nd Battalion the last days of November were spent at Dernancourt, where on a snowy field the mud-stained Battalion was inspected by AIF 2nd Division Commanding Officer General Legge. On the 1st December 1916, after a slow and cold railway journey, the village of Flesselles was reached and where the Battalion would stay seventeen pleasant days. Here the men were re-equipped and enjoyed excellent Christmas dinners, in lieu of Christmas itself which was to be spent back in the front-line.